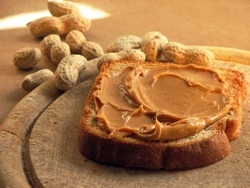 The results of the Immune Tolerance Network’s (ITN) “Learning Early About Peanut” (LEAP), discussed on February 23, 2015 at the American Academy of Allergy, Asthma & Immunology Annual Meeting and published in the New England Journal of Medicine, demonstrate that consumption of a peanut-containing snack by infants who are at high-risk for developing peanut allergy prevents the subsequent development of allergy. The LEAP study, designed and conducted by the ITN with additional support from FARE and led by Professor Gideon Lack at Kings College London, is the first randomized trial to prevent food allergy in a large cohort of high-risk infants. Peanut allergy is an aberrant response by the body’s immune system to harmless peanut proteins in the diet. The prevalence of peanut allergy has doubled over the past 10 years in the US and other countries that advocate avoidance of peanuts during pregnancy, lactation, and infancy. The LEAP study was based on a hypothesis that regular eating of peanut-containing products, when started during infancy, will elicit a protective immune response instead of an allergic immune reaction. Over 600 children between 4 and 11 months of age at high risk for peanut allergy were randomized to either consume or avoid peanut until age 5 in order to compare the incidence of peanut allergy between the two groups. Children in the peanut consumption arm of the trial ate a peanut-containing snack-food at least three times each week, while children in the peanut avoidance arm did not ingest peanut-containing foods. Of the children who avoided peanut, 17% developed peanut allergy by the age of 5 years. Remarkably, only 3% of the children who were randomized to eating the peanut snack developed allergy by age 5. Therefore, in high-risk infants, sustained consumption of peanut beginning in the first 11 months of life was highly effective in preventing the development of peanut allergy. Analysis data and figures from the published manuscript are available to the public on the ITN’s clinical research portal, TrialShare.